I'm gonna have to use several days for Annunciation sound files, because there are too many nice ones. The one for today is one of those Byzantine texts which the Schola commissioned a Chicago composer to make a contemporary setting of. This one was part of group of five Marian texts set by Dr. Frank Ferko, and then recorded in 1995 by the Schola Cantorum of St. Peter's in the Loop on the cd "Rejoice, Unwedded Bride," published by The Liturgical Press, Collegeville, MN (www.litpress.org). Ferko's setting has since been published by E. C. Schirmer, Boston, MA (now distributed by Morning Star Music Publishers, Fenton, MO)--please look it up and buy it. The translation of the text is from the "Festal Menaion" published by the Sisters of St. Basil the Great, Uniontown, PA. 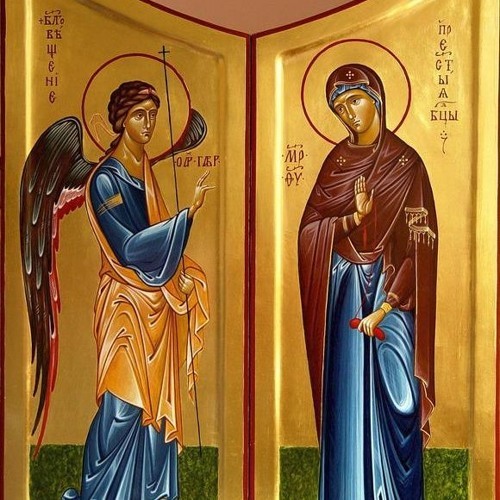 TEXT: Today is the fountainhead of our salvation, and the revelation of an eternal mystery: The Son of God becomes the Son of the Virgin, and Gabriel announces this grace. Therefore let us exclaim with him to the Mother of God: Rejoice, O Woman Full of Grace, the Lord is with you!